A 350 km from Hanoi, Sapa is now becoming a pretty tourist destinations due to the conditions of transport and accommodation. If you do not have much time, but you love the mountains and discover the culture of ethnic minorities, Sapa is an adventure destination to complete your trip to Vietnam. Travel to Sapa by train / TGV! There are several train day and night in Hanoi to Lao Cai - the train station to the Vietnamese and Chinese border closest to Sapa. 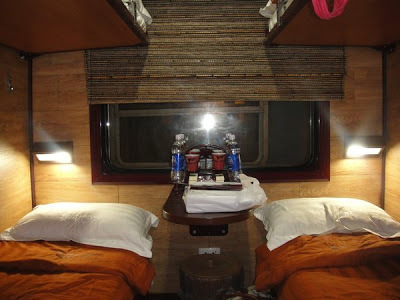 But the night train seems most convenient to Sapa because with 10 hours of transfer and a comfortable bed in an air-conditioned cabin, you can sleep. It is difficult for some people to fall asleep on the train because it is quite noisy. I called the TGV train in Vietnam, it is not "high speed train", but "the train of high vibration." There are 4 trains at night with the timetable departure from Hanoi at 19:40 SP5, SP7 at 20:35, at 21:10 SP1, SP3 at 21:50. Train tickets are national for sale directly to the Hanoi train station (120 Le Duan street) but to book the cabins higher investment by private companies, you should look at travel agencies. A series of railway privatized Victoria Express, Fanxipan Express Train Sapaly, Livitrans, Tulico Train Ratraco Train, Royal Express ... give you much choice. Among these providers, Victoria Express is the most expensive - about $ 100 per person 4-berth cabin for a spin and you must necessarily reserve your room at the Victoria Sapa hotel. The other choices are less expensive and more flexible in price from 35 to 40 USD per person in 4-berth cabin for a spin. Night trains arrive in Lao Cai at 5:00 to 6:00 the next day, the local buses are available for the short 35km transfer Lao Cai - Sapa to 40,000 VND (U.S. $ 2) per person. During the day, there are 2 train LC1 and LC2 but the journey is long because the trains stop at all stations. The local bus is another option for independent travelers. With the departure of the My Dinh station, the bus schedule Hanoi - Sapa are 5:30 p.m., 18:00, 20:30 and 21:00. In fact it is the night bus and there are sowing beds and seats. With 9 hour drive to Sapa even less expensive bunting and months (280,000 VND = 14 USD), the bus is quite reasonable for young backpackers. Renting a bike is easy to Hanoi price of 10-12 USD per day and you are in charge of gasoline. The route Hanoi - Sapa is quite good but dialogue. Landscapes are more beautiful if you take the road through Nghia Lo, My Cang Chai and Than Uyen. You must provide more or less 10 hours away, the picturesque Northwest and the rice terraces are for photo stops missed. The mopeds and motorbikes for rent are available at local tourist offices in the old quarter of Hanoi. The association O'chau Sapa allows ethnic minorities of Sapa area in Vietnam have access to education and to preserve the culture and traditions that make their wealth. The development of tourism in the region of Sapa in Vietnam helped families struggling to straighten the slope enjoying the windfall represented by this opportunity.Unfortunately, tourism is not as good as the business side takes over humans.Shu Tan, a 24 year old Hmong Tribe Black Hmong, knows the damage that can be caused by mass tourism.From an early age, she was a street vendor and this experience has profoundly. She took the party to react and is now trying to implement actions to address the lack of education of girls in his area, too busy selling handicrafts to tourists from all walks of life. The Sapa O'Chau Cultural Learning Centre was founded in 2010 and has not had the success they deserve dice its implementation: changing behavior requires patience, time and a certain amount of courage. This is indeed the strengths of Shu, which enabled him to persevere and not give up this project, which now forms part of the face of Sapa.The center allows young girls, all ethnic minorities in the region, have access to education. Not to mention the solidarity actions to bring warm clothes and food at the heart of the poorest villages. 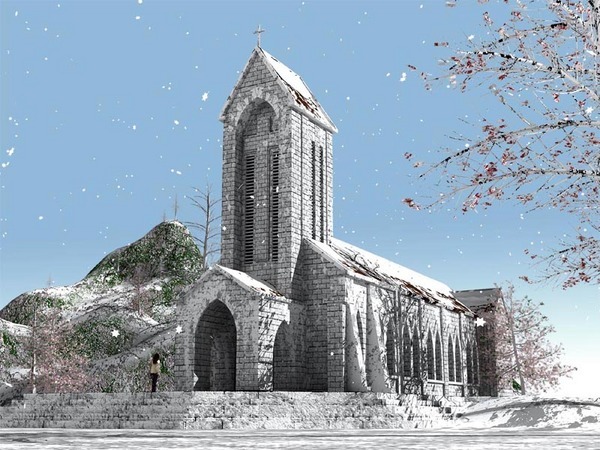 The concept Sapa O'Chau was assisted by the Australian who began by teaching English in the region well before the design center. Since the beginning of the center, they provided considerable efforts to increase awareness of travelers to the existence of the association. > Provide adequate clothing and footwear for children. > Financing improvements village schools in the region of Sapa. It ‘s in the northwest of Vietnam, 350 km from Hanoi, the heart of the beautiful mountains that stretches to the border of China and Laos, as the hill tribes resident more remarkable. Main destination of Northwest Sapa (pronounced Chapa) lies in a superb valley in a beautiful mountain ridge covered with hamlets, near the Chinese border. This beautiful region is populated by many ethnic minorities of the Hmong and Dao. As in other parts of Asia, outside influences have gradually eroded the rich cultural identity of so many ethnic minorities in Vietnam. Few of them still wear the traditional costume, with the exception of women in remote villages in the far north of the country. If the introduction of electricity, modern medicine and education are undeniable progress, this evolution is accompanied by the abandonment of traditions. Minorities enjoy full autonomy, and although the official national language is Vietnamese, children continue to learn their own language. Police and military often belong to the local ethnic groups well represented in the National Assembly in Hanoi. The poor roads once made access difficult Sapa from Hanoi. But since the improvement of roads, Sapa is now a very touristic place, however "this country blue, as it is called, located at 1650 m altitude still worth a visit. Almost daily, the Montagnards endorse their costumes around the most colorful and made their way to the Sapa market. On Saturday, the animation reached its climax: see farmers going to market and returning to their villages and hamlets mostly within 3 km from the city is a spectacle unto itself. You can observe games lovers teen-age marriage (13-15 years) dressed in their finest clothes that are different from those of married women, they find themselves in the dark corners of the market; not to sell trinkets to tourists, but to meet them and get to know the boys, away from prying eyes if possible. This is called Sapa "night market of love." For this courtship, the boys are up to three turbans around their heads. This ritual is far from being simply folk but absolutely essential for the social cohesion of these groups live dispersed, and it is a factor in the reproductive system of the group to avoid inbreeding. Around Sapa rice terraces are spread over the slopes of the mountains and hikes are organized to go to the villages where, with a guide, we can meet the villagers and more easily communicate with them. In Sapa, always the wearther is fresh it is necessary to bring a sweater, even in summer: do not forget that we are at an altitude of 1600 m and is often threatening rain, without interfering truly and without last time. In winter, by cons, it is necessary to dress warmly because it is cold (0 ° C) and wet January and February are the coldest months and more hazy. March to May, the climate is great most of the time. It is by observing the photos that you can realize the extreme wealth we disclose Sapa with traditional costumes, bags red pompoms, the lovely silver earrings and these lovely children who come to your meeting in a bucolic setting. Sapa, this should not undermine the morale you: after a long and winding road quite as lasting long enough, the reward is at the end of the road. When coming to the region of Sapa? 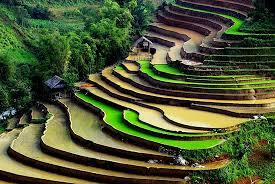 Sapa, the famous rice terraces populated by many ethnic minorities. The ideal place for a trek of several days with overnight at homestay and visit the colorful markets! Many treasures could not remain hidden:... a little effort to think outside the big trap will be necessary, but there are still plenty of corners well preserved! Three criteria must be taken into account in planning your visit to this region: the weather, the rice harvest cycle and market days. Visit an ethnic market is an amazing experience not to be missed, ideally plan the day of your arrival to Lao Cai. the dry season begins in March, April, May: the weather becomes very pleasant, good to hike and visit the ethnic minorities. It is also the season of flowers, but you will not see the famous landscape of verdant rice fields as it is when you plant rice. In June, the landscape is very green, but it rains a lot and it really starts to get very hot (30 degrees!). In July, it is also very hot and it's still raining a lot, but the rains are strong and fast. The rest of the time, the sky is blue and sunny. 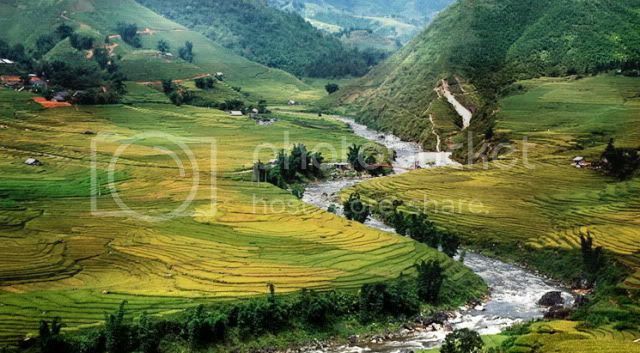 You can try a trip to Sapa as long as you stand the heat. In August, temperatures tend to be fresher rice fields are still green and there is less rain. In September, the landscape begins to change while remaining magnificent rice paddies are tinted yellow and the crops begin. This is an ideal time to visit Sapa. From November, it starts to be really less rice, the weather is nice but when it starts to rain, we already feel the cold of winter ... And the winter, it freezes at night here! Then, from December to February, it is winter, cold and covered everything worth avoiding. But i think it's better for you to visit my real house by real clip ! Easier to see what it look like and how it's ! We have a big house in local style: Stilt house with big front court for breakfasts or commun activities in groups. The court is designed as a small garden with the view to rice terraces .